See why it is so important that you clean your ducts regularly. Read why you should trust our experience and capabilities. Ensuring your air system is clean and free of debris. Learn about us and our dedicated team and family. Let our customers tell you why you should trust Productive. The furnace and air ducts act as your home's "respiratory system". This system can become "congested" when filled with contaminants and debris. Allergy sufferers can benefit greatly by reducing the amount of "triggers" that are present in ductwork. The proper cleaning of the air duct system is a necessity. Additionally,sanitizing and deodorizing, in certain circumstances, is key. There is no comparison to Productive's service and integrity. We are working hard to be Ohio's premier air duct cleaning company. More about duct cleaning. Click Here for a video on what you shoud know before having your ducts cleaned. 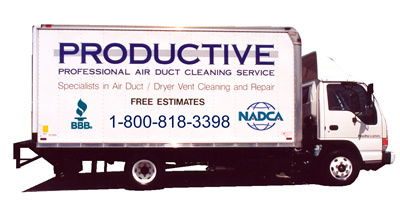 Productive Air duct Cleaning is family owned and operated since 1998. We are proud to hold a perfect Better Business Bureau record. Mike and George Grozan strive to deliver the best possible service to each and every home and business we serve. We are NADCA Certified and maintain the highest standards in the industry. We encourage you to contact us directly with questions, comments, and all requests.